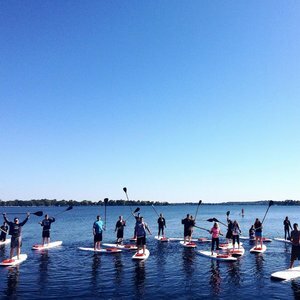 Yoga One is linking up with our friends at Hangloose MN to make it easy to find more lake side wellness this summer! Check out their classes! You'll love them! We do! We are Mike and Jaime Jost, owners and operators of Hangloose MN. We love all things water, and when we aren't teaching people to paddle board or wake surf, we are busy running our newest adventure, The Lake Carlos Marina. Get Britta's amazing pilates on the lake! Doesn't get any better than this! Join Hangloose MN for a paddle during the full moon! This 21+ event includes an adult beverage and light up Torch paddle! These fill up fast! June 9th. July 9th. Aug 7th.